This Beet and Ginger Soup is earthy, has a beautiful spice from the fresh ginger, and gets a lovely dose of creaminess from coconut milk. It is simple and straightforward, celebrating the strong flavors of the few ingredients involved. 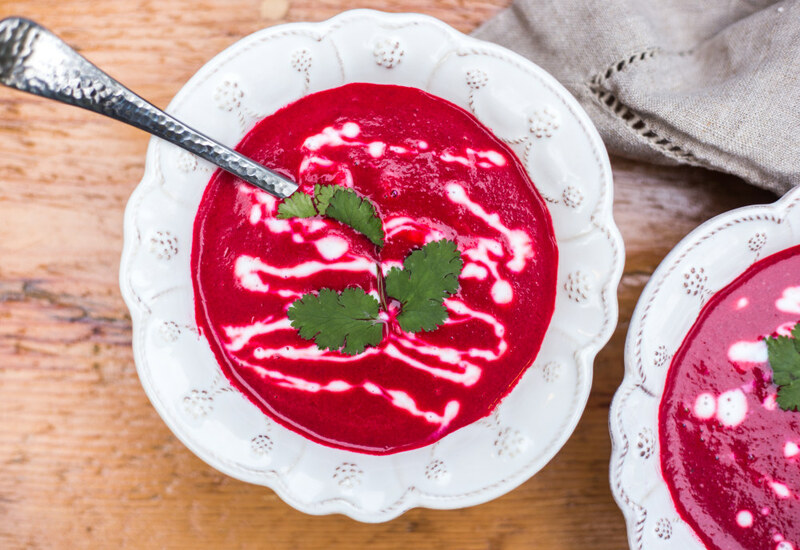 This is a great detox soup due to the many anti-inflammatory and digestive benefits of beets. To make this a more decadent soup, use 1/2 cup heavy cream in place of coconut milk. Per Serving: 235 calories; 19g fat; 17.0g carbohydrates; 4g protein; 0mg cholesterol; 696mg sodium. First time making beets and the pink color got all over my hands and counter tops! Totally worth it though, because the soup was so delicious. I love the earthy flavor, while also being creamy and flavorful from the onions and seasoning. I used heavy cream instead of coconut milk, really pleased with it.